Barliman Butterbur (called Barley for short) was the innkeeper of The Prancing Pony in Bree, which had been owned by his family for many generations. He was a short, fat man, bald and red-faced. 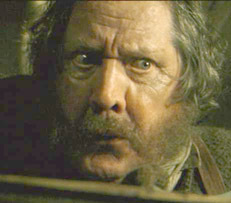 His memory was poor (“One thing drives out another”), and he seemed to be very absent-minded at times: on Mid-year’s day in TA 3018, Gandalf, who had learned that the Nazgûl rode in the guise of Black Riders, gave Butterbur an urgent letter to be delivered to Frodo, explaining this and warning him to leave the Shire immediately; Butterbur, unable to find anyone to deliver the letter, forgot about it until the four hobbits showed up at the Pony some three months later – to Gandalf’s anger. Yet for his failings in memory, Butterbur was very kind-hearted. Upon realising his mistake, he did everything he could to ensure that the four Hobbits had a pleasant stay at the Pony, providing them with bedding materials to be used as decoys for the Nazgûl, and giving them money for a replacement pony after theirs had been set loose from the stables. Distrustful of the Rangers, Strider in particular, Butterbur did not like the fact that the four Hobbits went off with him; he was surprised at the end of the War of the Ring to find that Strider had become King Elessar of Gondor.